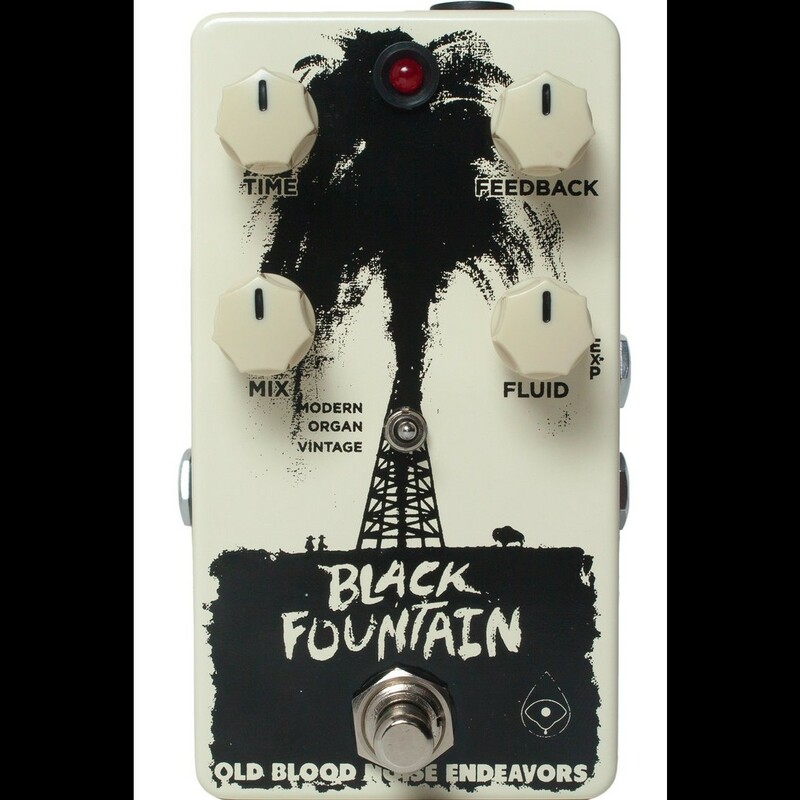 The Black Fountain reflects back to the days before the digital delay, emulating the sounds of the famed and elusive "oil can delay" units. These units emphasized a chorus-like modulation on the repeats of the effect signal as well as a beautiful and warm repeat cycle. The Modern mode emulates the classic long delay "oil can" units such as the Morley EDL, Tel-Ray Model 10 and Fender Echo-Reverb. The Time and Repeat controls mimic the functions of the vintage units, while the Fluid control introduces modulation based on the characteristic "wobble" of the electrostatic delay platter. The Vintage mode is similar in function to the Modern mode but has a grittier and more gain feel to the repeats. Both the Modern and Vintage mode have a delay time of 800 milliseconds. The Black Fountain now features an expression out jack and clickless switching. The output level can be tweaked via an internal trim pot for boost, slight drop, or unity gain.